Beehive Botanicals believes in a different approach to business: One where people come before profits. We believe the earth is our greatest resource and do all we can to keep our environment clean and healthy. We believe the most gratifying form of corporate profit is the kind returned to people and the communities that make it possible. 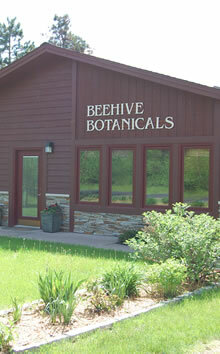 Beehive Botanicals was started here in Hayward, Wisconsin over 40 years ago by a remarkable man: Warren Ogren. His entrepreneurial spirit still lives in the company today through his daughter and granddaughter, Linda Graham and Michelle Graham-Forrester along with Sally Gagan, Vice President of operations. The company began by exporting one product, called bee propolis, to several countries in Europe. Propolis is still an important part of our business; however, as time went on, our customers asked for more products and services and we rose to meet their needs. The company was started basically out of Warren’s home in Hayward in 1972. At the time he had just retired as Hayward’s postmaster at the age of 55. Warren had an active mind and was always thinking of ways to make things better. He had a mechanical background and had taken some courses at University of Wisconsin in Madison before joining the Army. During his service, he was part of the Office of Strategic Services (OSS), the original CIA and taught the Chinese how to make radios. In 1972 he started beekeeping as a hobby and as was usual with Warren he needed to know all there was about it. It was while reading one of the bee journals that he came across an ad in the classified section “Wanted: Bee Propolis”. Every beekeeper knew what propolis was–a sticky, glue-like substance the bees collected from the leaf buds and cracks in the bark of trees — but Warren had no idea at the time why anyone would want to buy the stuff. At the time it was scraped out of the hive and rendered down with the wax; the wax was only worth about $.50 /lb. Warren was curious, so he wrote to the address in the classified ad and found that the man was serious and was willing to pay $90.00 a pound for the propolis in a very crude form. The company was from Denmark. There was just one problem … they wanted 100 lbs. to come in each shipment. Warren knew that each hive only produces about 1/2 lb. of propolis a year so that meant gathering the bees’ by-product from many beekeepers. So, Warren formed a company and named it Propolis USA. He then put his own classified ads in bee journals to buy hivescrapping, which, after cleaning, would glean around one pound of propolis for every five pounds of waxy hivescrappings. This work began out of his garage with his wife and brother working as helpers. Thus began a business that would take Warren and his wife, Vivian, all over the world searching for information regarding uses for propolis in human health and other useful products from honeybees and beehives. Every other year, they attended a conference called Apimondia. A place where beekeepers and other interested parties presented research on the honeybee and the many by-products of the beehive, including honey, pollen, royal jelly and propolis. These conferences brought them to Japan, China, Budapest, and many other major cities in Europe. After a few years of selling propolis to his one customer in Denmark, Warren looked at the US market for propolis-based products and found very few. So, like the mad scientist he was, he started work on his own formulas that eventually included products that used all of the beehive products including honey and royal jelly as well as propolis. Some of these products came under the trademark label “Honey Silk”. It was during this time that he decided to change the corporate name to Beehive Botanicals to indicate the fact we no longer were dealing in just bee propolis. After I came on board, Warren was off inventing and discovering other wonderful things but Beehive Botanicals continued on. More and more people were contacting us asking if we could create products for them. We had recently started encapsulating our own propolis, pollen, and royal jelly products and said, “Yes”, we can do this for you too.” Today we work with hundreds of herbs and botanicals that we either source ourselves or our customers supply to us. We provide our customers with capsules, bottled or bulk, liquid and powder fills. Our commitment to quality is exemplified by our GMP certification by NSF as well as being Organic and Kosher Certified. Our in-house laboratory assures excellence in raw material, testing and processing.